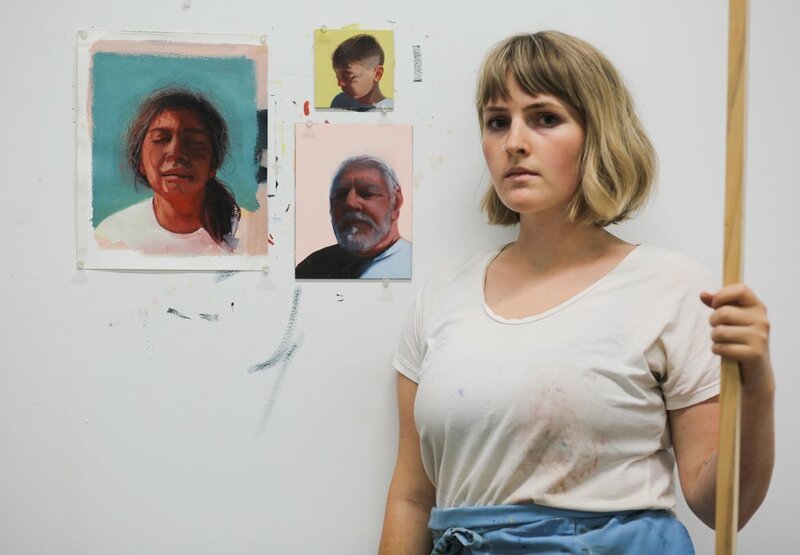 Since earning her BA at George Fox University(2016), Nicole Williford has explored work in both the arts and disabilities fields. Her work as a behavioral therapist has deeply influenced her studio work, fueling her curiosity regarding human thoughts and actions. She continues to pursue both of these professions from her home in Portland, Oregon. Are you represented by a gallery? I do not have gallery representation currently but work with a handful of consignment shops in the PNW and sell my work online. How much time is dedicated to the execution of the work before you actually start the process? Each piece is different but typically I spend many days/weeks researching in different ways before working on a piece directly. Sometimes this is done by immersing myself into a community I’m interested in painting about in order to learn more about what is relevant to them. Other times, it is me calling around to see if anybody develops old rolls of motion film I find in my grandparents attic in order to find images to paint from. Often in the least I take an hour to two taking photographs of my subject and talking with them to learn more about their experiences in order to paint an image that is reflective of them. How much time does it take you to create an artwork? Historically I have worked very quickly, often finishing a piece in one sitting but as I grow I have begun working on paintings for months at a time. I think this allows the piece to develop a more mature vision. Though this is more then norm now, I still do lots of quick studies before I dive into a longer piece. What is your ultimate goal for your artwork? What are you trying to express, or where do you see yourself going, with your body of work until now? Ultimately I strive for my work to be true - to my interests, the subjects, reality, etc. I also would like my work to invite people to pause, maybe think about something differently or for longer than they might normally. It is important to me that my work challenges me and others both formally and conceptually. Do you ever venture out of your creative process to try out new things? What is the price range of your art? As an emerging artist I sell my work anywhere from $50 to $3000, depending on size, content, etc. I have had very low pricing because my direct community does not have much flexible income to spend on art. As I develop and branch out, I am slowly adjusting my pricing to be more competitive with the broader market. How true are you to your artist statement? It is important to me for my artist statement to be accurate and descriptive of information viewers may not be able to access through looking at my paintings. This is where I can mention that I also have a career in behavioral therapy which flows from a similar spot - a deep interest in human behavior. Thanks. What is the average size of your artwork? I often am working on multiple pieces at once, anywhere from 4”×4” to 48”×72”. How many works have you sold recently? I have sold a handful of originals as well as some commissions, about 6 pieces in the past 3 months. I am currently exploring lots of new ideas and have a wall full of works in progress. It is helpful for me to see how each piece is speaking to the others and I usually work on a few each day so they develop somewhat simultaneously. Here you can see the wall I work on adjacent to my collection.